Blogs make money through having advertisements on them and also by selling products or services. I will cover all of this in detail in Step 12 below. For now, know that if you are persistent in building your blog, your content, and your readership, over time you will have the potential to make good money. How much? Some people make very little and give up. Don’t do that! When starting out, you might only make a few dollars a month while you are building your readership. Over time you could quite easily earn an extra $1000 per month from advertising revenues. Some top bloggers make a full living off their blog earning 5 or 6 figure incomes. And their are the tippity top blogs that earn in the millions. Your income potential is only limited by your belief and the work you put in. Of course you will need to be persistent and stick with it even when it seems like things are going nowhere. Build your network of blogging friends over time and compare notes, ask for feedback and share learnings with each other. And, of course, continually provide great content for your readers and they will reward you with loyalty and referrals. There is a ton of information available on making money through blogging. This post will give you the steps for setting up a WordPress blog, customizing it, getting traffic to your blog, and how to make money from your blog. I promise to offer details where it is necessary and help make things simpler where there is already a lot of complexity and confusion. There are other blogging platforms out there, but none compares to WordPress. It is the most popular and the easiest to use. It is also free. (Your only costs will be domain registration – about $10/year and web hosting – about $6.95 $5.95 $4.95/month.) I’ll guide you to getting the most important things done so you’ll get off to the right start. Then once your blog is up and running, you will have enough knowledge and experience to search the internet for information that will allow you to hone your blog even further. For now, this guide will be all you need. There are many steps, but with this post and the free WordPress Blog SetUp Checklist (free excel download), you can complete this quickly, in a day or two working full time, or you can spread it out over as much time as you need. The WordPress Blog SetUp Checklist will help you keep track of where you left off and a place to write down notes or questions to follow up on at a later time. Bookmark this page. Download the WordPress Blog SetUp Checklist (free excel document). Check off your progress and follow the steps one by one right online with this post. When you sign up for your domain, it’s important to know that Google search engines give more favor to sites that have bought their domain for longer than 1 year. So if you have the option to sign up for more than one year, do so as this will be to your benefit: you will ultimately get more search traffic from Google. When it comes to picking a domain name I suggest brainstorming on paper first. 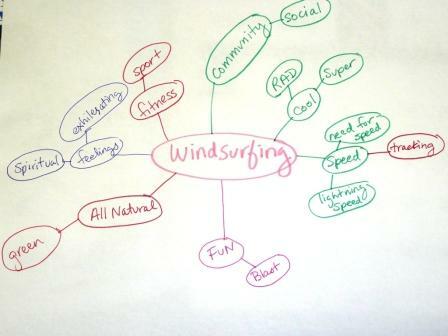 Mindmaps are helpful for generating ideas. You can check on availability at BlueHost. You may need to modify some of the names you thought of. They will also make suggestions for you too. So now you’re ready to move on to Step #3 now to both buy your domain name and purchase your webhost, which for both I recommend using BlueHost. If you want additional ideas for designing your domain name click here for more information on that topic. I recommend one of the following 2 webhosts depending on your needs. Choice #1 will suit 90% of new bloggers. Choice #2 is more expensive, but a good choice if you plan to have high traffic pretty quickly. Unlimited hosting storage space, unlimited file transfers, and unlimited domains. Also unlimited Email accounts. $100 towards Google ads for promoting your blog. Fast, reliable, and safe. If you want the technical specs on this, click here. ANYTIME Money-Back Guarantee. It doesn’t get better than this guarantee. The name says it all. This option costs more, but makes sense if you have plans for a website that may include heavy traffic early on or large spikes in traffic (visitors) to your website. If this is the case you might want to consider MediaTemple as your webhost. This is the webhost that I use for some of my sites that often experience large spikes in traffic. MediaTemple has a shared hosting “Grid-Service” that allows them to handle big traffic spikes without your site slowing down or crashing. When you get big spikes in traffic you want to be able to handle it or else you lose all that opportunity. They also offer dedicated servers if your site is going to be really big. MediaTemple‘s Grid-Service costs a little more than BlueHost ($20/month vs $5/month), but is totally worth it if you want to take advantage of big web traffic. Plus they have EXCELLENT customer service and One-Click installs for WordPress just like BlueHost. Here is a screenshot of where you will type in your two nameservers: Now your domain name will be pointed to your web host. That’s it! It takes about 3-5 hours for the site to propagate over at your web host. And in rare cases it can take up to 24 hours. Once propagated you and everyone else will be able to see your site on the web. Even though you can’t see your site on the web yet, you can still work on getting your blog set up at your web host! So let’s move right onto Step #5! You’re done installing WordPress!The system is now installing all the WordPress code for you! It only takes a few minutes. You will receive a confirmation email from BlueHost (your web host) with the username and password you chose along with any other information you might need like support phone numbers etc. Copy and Paste the key parts of that email into your BLOG FILE. Give it the heading “WordPress Login Info” or something like that. If you don’t land at your dashboard, just give it a couple more minutes while your web host is installing WordPress to your site. When it is installed this is what you will see: In Step #14 I have links to multiple articles on getting started with using WordPress. In the meantime, lets continue with the next step which is setting up the look of your blog, called your Theme. In this step you will choose the overall look of your blog. There are many free WordPress themes. The best place to search for one is at the WordPress Theme Viewer. All themes can be customized with different colors, fonts, font sizes, layouts and more. However, you should look for one that is pretty close to what you like unless you are comfortable changing the code in your theme. Below I list some premium themes that make customization easy if you don’t want to deal with changing code. (Even thought I can do the coding I find the premium themes to be well worth the cost.) Look for themes that are compatible with the latest version of WordPress that you just installed. You’ll be able to check on this at the theme view. You can also find themes by searching for “WordPress Themes” in Google or your favorite search engine. And of course in your WordPress dashboard you will be able to see lots of different themes available under “Appearance>>Themes.” The theme that I am using as of this writing is the “Genki Theme Fixed Width” by ericulous. It is compatible with WordPress 2.7 and I like how it has 4 widget areas in the sidebars. Headway Theme is a very flexible theme. For me it was almost too flexible in terms of laying out the site, but that was me. I found that Catalyst Theme gave me more “bones” to start with, a framework, that made it easier for me to design my sites. You might like this one though if you want ultra flexbility, i.e. starting with a blank slate and building. Also it has probably improved since I was working with it a couple years ago. The Thesis Theme is very very popular. 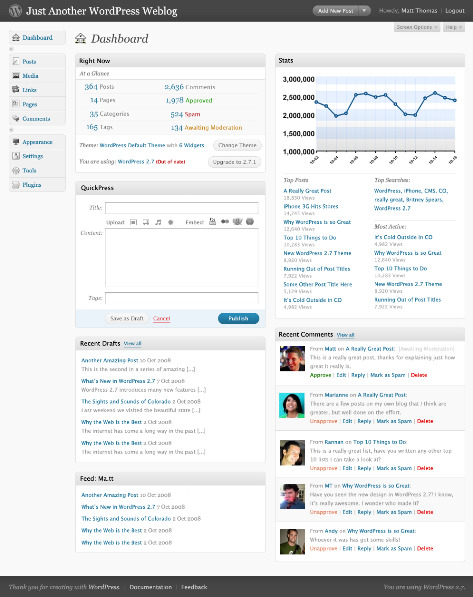 It also comes with a control panel for customizing the look of your blog. When you click on the above icon to see more about the them you’ll be able to see many blogs that have used this theme to create spectacular looking sites. To do a lot of customization requires some coding type work, but they have a great library of videos that show you how to do just about anything you want with it. There are many ways to configure this theme including several different layouts, all without touching a line of code! Unique Blog Designs is known for their beautiful, simple, and elegant web designs. Click here to see a very short video demonstration of how the theme looks and works. (Click on the “Learn More” button to see the video.) They are all excellent and all are highly recommended within the WordPress blogging community. But if you want to keep it simple, you can’t go wrong with the Catalyst Theme. There are two ways to install a theme. 1. WordPress Dashboard Method Most of the free themes you can install right through your WordPress dashboard under “Appearance>>Themes>>Install Themes.” Just pick the one you want, “install” and then “activate” it. 2. FTP Method Some themes, especially premium themes, use this method. Don’t be scared. It’s easy if you just follow the steps. Also check to see if your theme has special installation instructions. Congratulations! Your theme is set up! Troubleshooting tip: if the theme you uploaded doesn’t show up it may be because of step 3 above. Double check that again. That’s it. Takes less than 1 minute and it is well worth it! At this point, you could write your first post if you wanted to. If you want to wait until everything is in place then keep taking the next steps. Plugins add functionality to your blog. The install is the same process as installing your theme (Step#7). You have two choices for installing. WordPress Dashboard Method – just like installing a theme, go to “Plugins>>Add New.” Search for the one you want. Then choose “Install” and then “Activate.” Some plugins have additional setup options which are usually found under “Settings” in your dashboard after you have activated the plugin. FTP Method – You download, unzip, and then transfer the plugin files to your site via FTP (FileZilla) except this time you put them in the “Plugin” folder on your “remote site” not the “Theme” folder. The “Plugins” folder is inside the “wp-content” folder on your remote site. Have that folder open before you drag the plugins over. (See the exact steps below.) Once uploaded, go to “Plugins” in your WordPress Dashboard and click on “Activate” to enable each plugin. For each plugin, there may be additional instructions for usage that you will find on the page where you downloaded the plugin. Here are the plugins that I recommend installing. They are all free, as are most WordPress Plugins. The ones that are in Bold I recommend installing first. You can click on the link on each to get to the download page: Acurax Social Media Widget A Simple WordPress Plugin Which Allow You To Add Widget Which Links Social Media Icons to Your Social Media Profiles Twitter,Facebook,Pinterest,Youtube,Rss Feed,Linkedin,google plus. You can define icon style size for each widget. Akismet checks your comments against the Akismet web service to see if they look like spam or not. You need aWordPress.com API keyto use it. You can review the spam it catches under “Comments.” To show off your Akismet stats just put<?php akismet_counter(); ?>in your template. See also:WP Stats plugin. ByMatt Mullenweg. Originally authored bySteve Smith, this plugin detects all ways to access your original WordPress feeds and redirects them to your FeedBurner feed so you can track every possible subscriber. ByFeedBurner. — AddsGoogle analyticsto your blog, with all sorts of advanced tracking toys enabled. ByDenis de Bernardy. You will need to sign up with Google Analytics to use this. It is free. On-demand backup of your WordPress database. Navigate toTools ? Backupto get started. ByAustin Matzko. WP-ContactForm set up a contact form on your “Contact” page without having to give out your email address. WP Contact Form is a drop in form for users to contact you. It can be implemented on a page or a post. It currently works with WordPress 2.0+ ByRyan Duff, Peter Westwood. Sharebar Adds a dynamic bar with sharing icons (Facebook, Twitter, etc.) that changes based on browser size and page location. More info and demo at: Sharebar Plugin Home. Read my review here of this social media share bar and other similar plugins. These are networks that work as a middleman. They secure the advertisers and you provide the advertising space. The way they come together is by placing their ad code in a sidebar text widget. When you sign up with any of these they will give you the code you need and instructions for placing it in your blog. They will keep track of all sales and they will usually pay you monthly either through ACH, PayPal, or a check. If you don’t want to keep track of your banner ads there is a great solution: Banner Advertising Services. There are two major options at this time: PassionFruitAds and Adproval. I use PassionFruitAds. They have a very nice service and don’t take too much off the top of your revenues. This is pretty self explanatory. You come up with the products and services that you want to sell personally. Then you design the text or banner advertising to go along with it. You place the promotion for your products and services into blog posts and/or into your sidebar with text widgets. You can also outsource the production of products that you’d like to sell and have them drop-shipped to your buyers so that you never have to handle inventory or shipping. One example is CafePress that will produce t-shirts, mugs, and other items with your artwork on them. The Blog Mastermind Coaching Program. This is a step-by-step, weekly coaching program led by famous six-figure income blogger Yaro Starak. He has pages and pages of testimonials from his successful students. He teaches you how to set up and profit from your blog. If you want to fast-track making money from your blog, this is truly worth your consideration. “Blogging All the Way to the Bank” – this ebook teaches you some advanced techniques for growing your blog and making money. I learned some new and profitable tips from this book and definitely recommend it. Merchandise: bumper stickers, t-shirts, etc. You could look into CafePress.com. Here are a few highly recommended programs to check out: “Blogging All the Way to the Bank” – this ebook teaches you some advanced techniques for growing your blog and making money. I learned some new and profitable tips from this book recently that I am excited to implement soon. “Launch the *** Out of Your eBook” – for when you write your first ebook. This is an awesome book that will help you sell lots of copies of your book. I highly recommend it as do many others. “SEO Book Training Program” – This is a comprehensive training program for learning SEO. It comes highly recommended. They also offer many free and very valuable SEO tools plus some basic free training. There is a fee for the advanced training. (UPDATE: Dec 14, 2009) If after reading all the above information, you want someone else to do all the heavy lifting of setting up your wordpress blog for you including the web hosting, installing of wordpress, etc., then look no further than Page.ly. This is a new offering that I haven’t seen anywhere else! Everything is set up for you. There are dozens of super cool themes to choose from. The greatest part is that set up literally takes 2 minutes! And if you want read what others think of Pagely they have many testimonials praising their service. If I was starting all over again, I would be very tempted by this option! Combine this with The Blog Mastermind Coaching Program to get ramped up quickly on making money from your new blog. Blogging Extras Find out how to add a Favicon to your site. A favicon the little image that appears in the tab of your browser along with the title of the website. I hope you enjoy blogging as much as I do! And I wish you much success in making money from your writing. With practice of your writing craft and persistence in building traffic to your blog, you will definitely succeed! Disclosure: Life Learning Today receives compensation from some of the companies whose products we review. We test each product thoroughly and give high marks to only the very best. We are independently owned and the opinions expressed here are our own. We do not accept compensation to review a product. We only include reviews of products that we find to be of the highest quality. Please share your comments, thoughts, questions, and links to your new blog! Please come back and fill us in on your progress & success! If you found this post valuable, perhaps you’ll be kind enough to vote for this with aStumbleorDeliciousbookmark.Votes are always appreciated! Thank you! Thanks for all the steps! I see that your original post is from 2009, so perhaps some things have now changed. When I installed WordPress from Bluehost, it gave me the wordpress.com version. If I want to change this to the wordpress.org version in the future, can it be done easily? @Nadine – yes it is easy. If you start with wordpress.com – their free solution – it is very easy to convert it over to your own hosted solution later on. 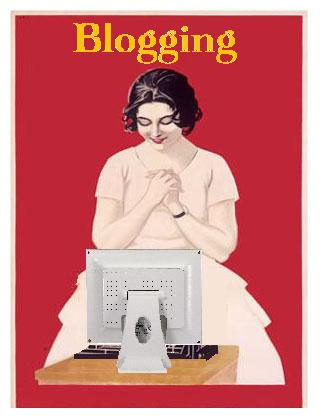 This is the BEST article on setting up a blog. I have it bookmarked and refer to it whenever I have a question. Tom – Thank you so much for saying so! That’s very kind of you! Thanks a lot it was really a nice article And helped me so much..
Nitish – so glad! Thanks! @Gandalf – Thanks! So glad to hear it! Thanks for help!! Just installed our blog via Bluehost!! Cheers from India..
@Sonicjar – Wooooo! Congrats!Best of luck! I read a lot of money making blogs but this is the one I get a complete guide to make money with WordPress. Seems you are not updating long times, please keep it up. I really like your tip about a blog file. I kind of did this when I first started but had I seen this tip I would have organized it a bit better.